So this has been a pretty hard adjustment for me to make. In addition, most cereals, even the "healthy" ones, tend to be high in sugar. The plan I was following touted Grape Nuts as a good choice for a low sugar, cereal at 5 grams. Well it also tastes a bit like gravel.....but I digress. So I began a search for something with a little more "taste." 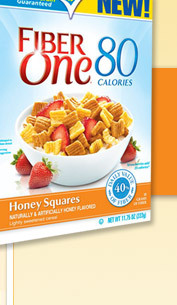 I came across Fiber One's new cereal - Fiber One 80 Calories. A serving size is 3/4 cup, which is 80 calories and 6 grams of sugar. This is only 1 gram above Gravel Grape Nuts, so I was a little skeptical about how well it could taste. Well I must say, I was more than pleasantly surprised. It reminded me a little of the Honey Grahams cereal from our childhood. (Again, one that tastes good right out of the box) Nice right? Anyone else out there on the in the same boat who would like to share a healthy new food they've discovered?? 8 oz. unsweetened almond milk, 1 banana, 2 tbls wheat germ, 1 spoon full peanut butter, 1 tbls cinnamon, 1 tbls honey, 3 heaping spoons of plain non fat yogurt. Blend it all together & enjoy. It's delicious, satisfying & healthy. I've heard good things about honey & cinnamon. I'm convinced that having this smoothie regularly has kept cold & flu bugs away from me! I'm not a big cereal fan either. I've been enjoying plain greek yogurt with granola and berries. It's enough to fill me up and keep me going most of the day. When I do eat cereal it's usually great grains. I love smoothies for lunch. @ Barbara - I do love granola too but the sugar content is rough...I try to sprinkle just a little on top of the regular cereal.